St. Patrick, Patron Saint of Ireland. The Feast of St. Patrick is celebrated by the Roman Catholic Church, the U.S.Episcopal Church, as a commemoration by the Evangelical Lutherans, and venerated in Orthodox Church. It is a public holiday in Ireland. The shamrock was used by St.Patrick to explain the Holy Trinity. In Ireland it is celebrated by families getting together for a meal. If the day falls on a Friday during Lent, observant Catholics receive dispensation to eat meat. If the feast day falls during Holy Week (and it does occasionally), the feast day is moved to avoid conflicting with the Holy Week calendar. A more recent occurrence are public festivals in Ireland and use of the day to promote Irish culture. The first is a wonderful rendition using Irish traditional musical instruments. And the second is from a more modern source (and set in the future) from Star Trek:The Next Generation episode The Wounded where the song has an important role. Chief O’Brien uses the tune to remind his old captain of his duty and what he has done. It is hard to believe but celebration of the patron saint of Ireland is more boisterous far outside its green shores. While nominally a feast day on the liturgical calendar of the Roman Catholic Church, it has become a major day for people to get together and party. Being Irish is not required but does lend authenticity to saying you are actually a descendent of the Emerald Isle rather than just adopting it for a day. Of course many Irish left that fair isle long ago. Jobs were few and many people starved. And freedom to starve is not much freedom which is why many Irishmen had to serve in the military of their oppressor. Some came to America as my great-great (and more but you get the point)did to start a new life. He was recruited in Ireland to join the Union Army during the American Civil War. He served two tours, was a musician, and his papers showed he was a tall man. And he started a new life here in America leaving Ireland behind for good. He never went back. My grandfather was often asked because of his Irish last name whether he was Irish.”No, American,” he would say. It was something his grandfather said and was passed down. He never thought himself Irish or Irish American, just American. St. Patrick’s Day was not treated as a day to get drunk or eat too much food (it is the Lenten season after all). Instead it was simply quiet reflection, a prayer of thanks, and a delicious meal with family. And family is what is it all about. Not about green milkshakes or wearing green, drinking vast amounts of beer. Like Christmas which has its secular and spiritual markers, so it is with St.Patrick. The faithful honor St. Patrick while others have a party. To each his own. One of the sad remnants though of the migration out of Ireland is that today Ireland, outside of the major and smaller communities, is very empty. You cannot shake the feeling when you see that emptiness how bad it must have been for whole communities to evaporate leaving perhaps just the oldest behind who for one reason or another choose to stay. Today in the United States you can see this process underway in the many dwindling rural communities in the Midwest or in old cities that were once giants in the land slowly shrinking as people leave for other opportunities. 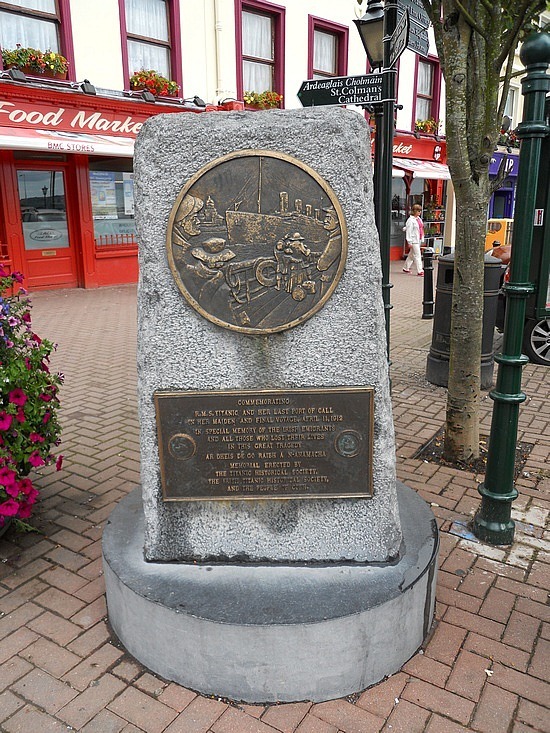 Titanic Memorial in Cobh (formerly Queenstown), Ireland. 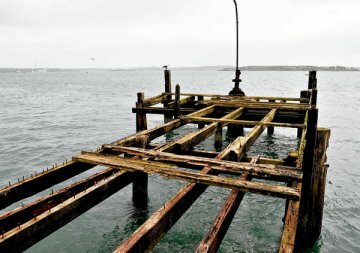 The Irish Examiner reports that the historic pier in Cobh, Ireland, where people boarded Titanic, has been sold to Titanic Experience. Titanic Experience is on the site of the former White Star Line ticket office adjacent to the pier. The pier is in serious disrepair requiring considerable work to make it safe. The Cobh Town Council was disappointed to learn of the news as some desired it be taken over by the city. However confusion over who actually owned the pier was a sticking point for them to proceed. It appears Titanic Experience managed to make a determination and purchase the pier. Some bracing work has begun on the pier. *Due to a policy of demanding payment for links to Republic of Ireland newspapers, this blog does not provide such links.